A funny and fiercely passionate new play about enduring friendship, the power of imagination and the stories behind the headlines that quickly become yesterday’s news. 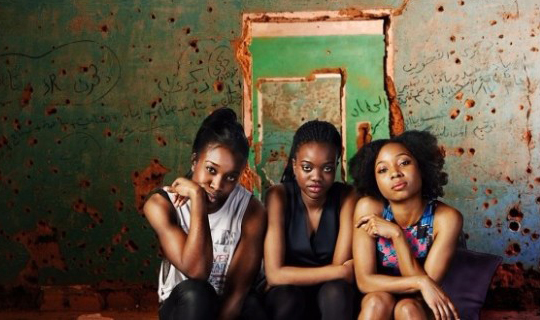 Theresa Ikoko’s Girls is a Verity Bargate Award finalist and winner of the Alfred Fagon Award (2015) and joint winner of the George Devine Award (2016). She is a Talawa Writers’ Programme Playwright and a Channel 4 writer on attachment to HighTide. Theresa Ikoko’s funny, passionate and explosive new play won the Alfred Fagon Award in 2015. Theresa is a Talawa Writers’ Programme Playwright and her play Normal was previously staged at Talawa Firsts and HighTide. Directed by Elayce Ismail (The Rise and Shine of Comrade Fiasco), Girls makes its world premiere this autumn at HighTide, followed by the London premiere at Soho Theatre.
" ... Winning means a lot to me ... but in particular, for me, because of what thisstory is. In Girls Haleema tells Tisana that nobody cares, and for so many people who feel forgotten and/or unworthy, that is their truth. Tisana rejects that truth, telling Haleema that she cares, and that others must. The George Devine Award says to me that maybe, these amazing people in the industry are not only behind me, but that they got behind these three girls, recognised them, related to them and said"we care too". It's empowering ..."